USADA announced today that Paulo Miyao, of New York, N.Y., an athlete in the sport of Brazilian Jiu-Jitsu, has tested positive for a prohibited substance and accepted a two-year sanction for his anti-doping rule violation. Miyao, 25, tested positive for clomiphene as the result of an in-competition drug test conducted on June 5, 2016, at the International Brazilian Jiu-Jitsu Federation (IBJJF) World Jiu-Jitsu Championships held in Long Beach, Calif. Although the IBJJF is not a signatory to the World Anti-Doping Code, USADA was contracted by IBJJF to conduct testing for the event and collected Miyao’s sample in accordance with the World Anti-Doping Agency (WADA) International Standard for Testing and Investigations. Following notification of his positive test, Miyao challenged USADA’s jurisdiction to bring a case against him under the USADA Protocol and WADA Code. 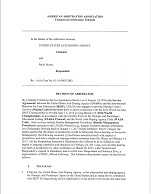 After a jurisdictional hearing before an independent arbitrator from the American Arbitration Association, the arbitrator upheld USADA’s jurisdiction over Miyao for the purpose of adjudicating his positive drug test result from the 2016 IBJJF World Jiu-Jitsu Championships. This decision, as well as other arbitral awards, can be found here. Miyao’s two-year period of ineligibility began on September 29, 2016, the date he agreed to cease competing in any activity or competition associated with the IBJJF, or any Code signatory. In addition, Miyao has been disqualified from all competitive results achieved in competitions sanctioned by the IBJJF, or any Code signatory, on and subsequent to June 1, 2016, the date the 2016 IBJJF World Jiu-Jitsu Championships started, including forfeiture of any medals, points, and prizes. IBJJF has agreed to impose the sanction.